Handle Fillers There are 4 products. If you need a quick and easy handle to finish off a basket, these Ash Handle Fillers are for you. 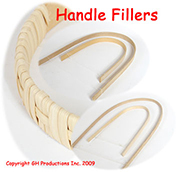 Handle Fillers work exceptionally well if you wrap or cover your handle with narrow Flat Reed or Cane. Handle Filler 1/2 in. x 24 in. Handle Filler 1/2 in. x 36 in. Handle Filler 7/8 in. x 24 in. Handle Filler 7/8 in. x 36 in.